This is a big question for many and worth some major consideration. Did you know that a majority of problems and manufacturers defects in refrigerators today are caused by the water and ice dispenser or the ice maker? 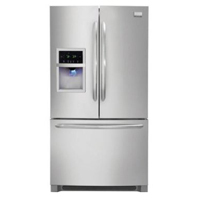 Frequent problems with water lines freezing up or lots of the noise from the ice maker abound. Reliability is another issue that crops up often with stop, start operation. It’s important to evaluate the performance over time of a manufacturers experience with this feature. For one, water and ice dispensers add a tremendous cost to a refrigerator. Yes, they are convenient, but the cost difference can be upwards of $800 – $1000. That’s a lot of convenience cost. Some do not like the appearance of the ice and water dispenser (count me as one), but there are new internal dispenser options for this feature which somewhat eliminate the need for the dispenser being on the outside door. However, this option costs loss of energy due to the fridge having to work harder from frequent openings. Another issue with water dispensation systems is the cost and hassle of replacing the filters. If you do not replace the filter often you might as well be drinking your tap water – or worse. The costs for the water filters varies greatly from $22 to $39 so consider those extra costs. But let’s suffice it to say that it’s a lot more expensive than a Brita filter for a water pitcher. One option you might consider if you do not want the extra cost of a refrigerator with a dispenser as well as high filter costs is just a simple filtration water pitcher like a Brita. It certainly is not as convenient, and if you keep it in the fridge you will lose some of those savings due to having to open the fridge much more often.